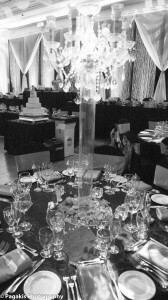 The following information, from Montreal Weddings, will help guide you through planning the steps of your wedding reception from the cocktail period to the receiving line. 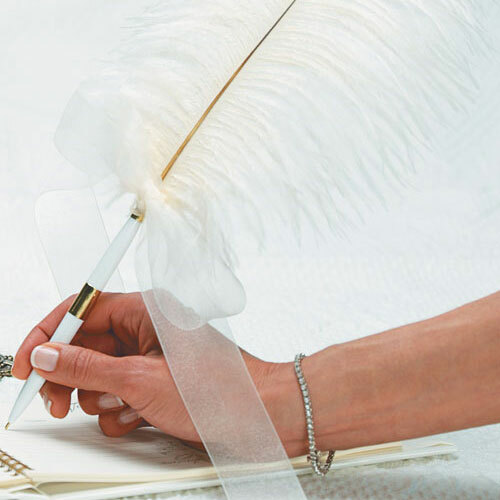 It includes advice to help you with setting up the head table and guest tables, meal and beverage planning, and important moments during the evening such as toasts and speeches, cake cutting, bouquet and garter throwing, etc. Some couples like to have their family and friends sign a guest register for a memento of the occasion. The register is placed on a table, near the entrance or at the end of the receiving line, and a bridesmaid or family member is usually assigned to stay beside it and remind each guest to sign. A cocktail should be served to the guests waiting for the couple, or if there is a bar, make sure that everybody is served. Have an attendant in charge of this as well. A long table can also be prepared with punch and glasses. Another procedure is to have a waiter standing with a tray of champagne glasses or a plate of hors d'oeuvres with cocktail napkins to offer guests as they pass by. 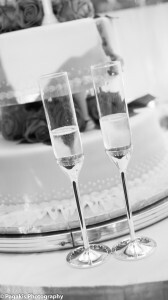 Montreal Weddings recommends to always offer an alternative to alcoholic beverages. If the receiving line has not been done directly after the ceremony, it should be formed in the hall of the reception site, or in the room after picture taking. As host, the bride’s mother stands first in the line to greet the guests. The bride’s father is next, followed by the groom's mother and father. Divorced parents should not stand in the line together to avoid confusion for the guests. If the divorced parents are remarried, they can stand in the line in couples, separated by the other parent's couple. As the fathers are not necessarily required in the line, they may easily circulate among the guests instead. The bride comes next with her husband. The maid of honour stands beside the groom. The bridesmaids may or may not stand in the receiving line. Young children and ushers never stand in the line. Always take gloves off. The guests pass by as quickly as possible. Each person in the line should introduce the guest to the next person in the line. This encourages personal contact and minimizes delays from long conversations. Thank each person for attending, shaking their hand. At very formal weddings, there is occasionally an announcer standing directly before the bride's mother. This is helpful if she doesn't know many guests on the groom's side. You may choose to eliminate the receiving line if you think you’ll be able to speak to all the guests during the reception. If you want to be seated with your wedding party, a long table is set up at one side of the room. The couple leads the way to the table. They sit at the centre of the long side facing the guest tables, with the bride seated to the right of the groom. The maid of honour sits to the groom's left, and the best man to the bride's right. The father of the bride is seated on the right side of his wife, next to the best man. On the other side, the groom's father is next to the maid of honour so that men and women alternate on each side. The other attendants sit on either side, along with their wives or husbands. If the bridal party is too large, the bridesmaids and ushers can have a special table in close proximity. If the couple has few attendants, their close friends, grandparents or the officiant can join them at the bridal table. The bridal table should be specially decorated and have a centrepiece (or two or three if it’s a long table). The table should be large enough to accommodate the bride and bridesmaids’ bouquets. Make sure to communicate the size of the table to your decorator. The wedding cake is not placed on this table, but on a separate table on wheels for the cutting ceremony. If there is a separate table for the parents, the mothers and fathers of both the bride and groom, the grandparents, the ceremony officiant and sometimes the godparents will sit there. You can also have two separate tables to allow each set of parents to be seated with their respective families. The parents' table is usually placed close to the bridal table and should have a "reserved" card on it if there are no table numbers. If the parents of either the bride or groom are divorced, they should not be seated at the same table. 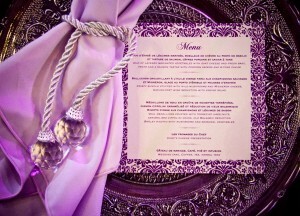 When there is a seated dinner, there are always place cards for the bridal table and the parents' table. Whether the food is served buffet style to the guests or not, the bridal table is always served by waiters. When there is no bridal table, the newlyweds go to the buffet table themselves and take their plates to the table reserved for them, or they can again be served by waiters. 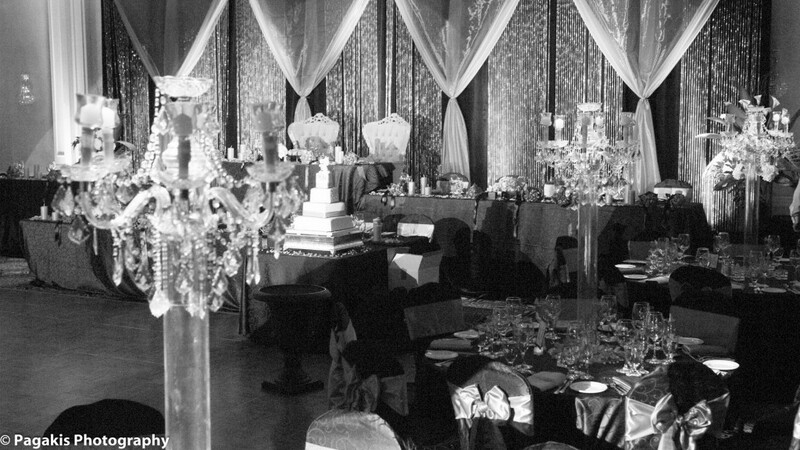 It is highly recommended that the tables not be divided down the middle of the room with guests of the bride's family on one side and guests of the groom's family on the other. They should be mixed to keep a friendlier atmosphere. 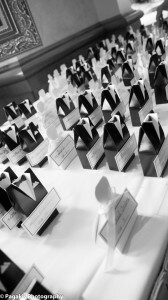 Frequently, place cards for guests are used and tables are numbered. A diagram of the tables with their placement should be installed at the entry of the room. Assign couples with similar interests together. If a meal is to be served, tables are formally set with tablecloths, floral centrepieces and complete place settings. One tradition is to give your guests a small gift in appreciation of their love and support. Popular versions of wedding keepsakes include small bundles of candy or candy-coated almonds wrapped in coloured tulle, pairs of chocolate truffles packaged in small boxes, or other small objects like framed pictures, porcelain items, small potted plants, etc. These should be placed on the guest tables. You can find a vast selection of gifts and favours in our online store. If you have invited children to the wedding, seat them together unless they are very young. Ask for a babysitter or attendant to entertain them. You can also hire clowns. Be sure to have booster seats for the youngest ones. Teenagers will prefer sitting with their peers instead of the adults. Allow extra seating for unexpected guests or staff. Have the ushers help the guests find their tables. The reception site service staff can also guide your guests to their tables. For a small wedding or a second marriage, you can simply invite relatives and friends to the bride's home after the ceremony. This is the least formal type of reception, but even so, the menu should be carefully planned and as beautifully prepared as possible. If you have more than twenty guests, you will need professional help. The caterer may provide food, cake, serving staff, crystal and china, while a rental supplies store will provide you with tables and chairs, a tent, and many other items you may need. Depending on the formality of your wedding, you can choose to have a hot meal served, a buffet with seating at tables, or a stand-up buffet. A caterer or the manager of your reception site must be consulted well in advance. It is wise to follow their recommendations, as they will suggest the menus that they prepare best, which have proved to be most popular and that fits in your budget. Be sure to have a precise number of guests for the caterer. 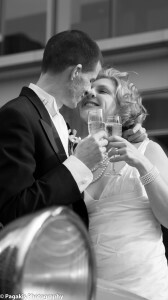 Champagne is the traditional wedding drink. Depending on your budget, it can be replaced by a sparkling white wine for the toasts. Don’t hesitate to ask your bar expert to create a signature drink in your honour that can be served during the cocktail period and throughout the reception. During the meal, offer wines according to the menu. Many people serve no alcoholic beverages at all. Make sure that the bar can offer alcohol to those who want it. At any time during the reception meal, guests may start clinking their glasses with their spoons to get the newlyweds to kiss. Do so if you want to avoid excessive noise. Some couples ask for a song or story instead of glass clinking before they will kiss or they provide little bells for ringing. You can find bells in the online store. At the head table, the bride's glass is filled first, followed by the groom’s and then those of the attendants, starting with the maid of honour. As soon as the glasses are filled and the guests have been served, the best man rises and makes the first toast to the couple. They will drink crossing their arms for this initial toast. The toasts are usually short and rather sentimental. Other members of the bridal party may propose toasts. Everyone rises for toasts except the bride and groom. The groom invariably toasts his bride (he rises) and his new parents-in-law (who rise as well). If there is no bridal table, the best man gets the attendants (ushers and bridesmaids) together so they can join him in toasting the newlyweds. When telegrams have been received from relatives who can't be at the wedding, they are usually read aloud following the toasts. The best man does this and then gives the telegrams to the bride's parents. If there is only one special dance, it is started by the bride and groom, after which their attendants join them. 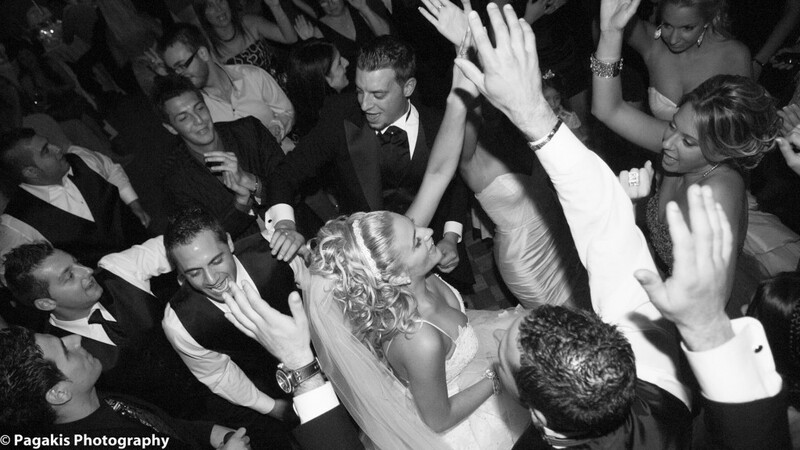 No one dances before the bride and groom have led the way. 1. 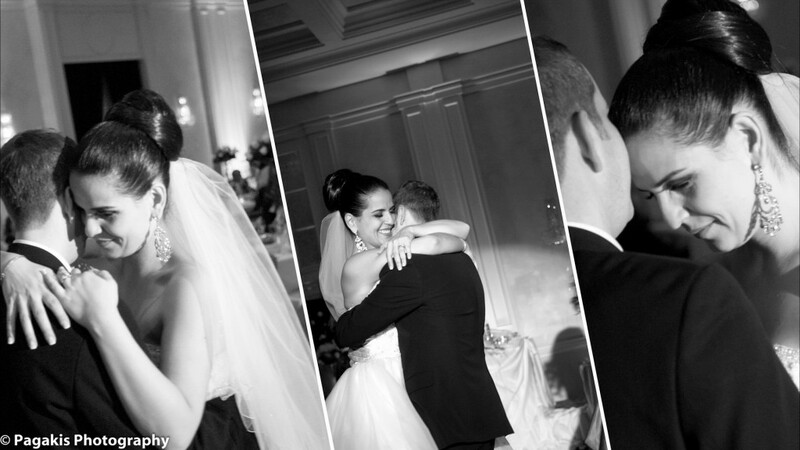 The first dance always begins with the bride and groom. It is usual for as many men as possible to dance with the bride as the dancing becomes general. Each usher should dance with the bride and all of the bridesmaids. The traditional first dance is usually a slow dance or waltz. Parents and attendants are invited to join about halfway through the first dance. 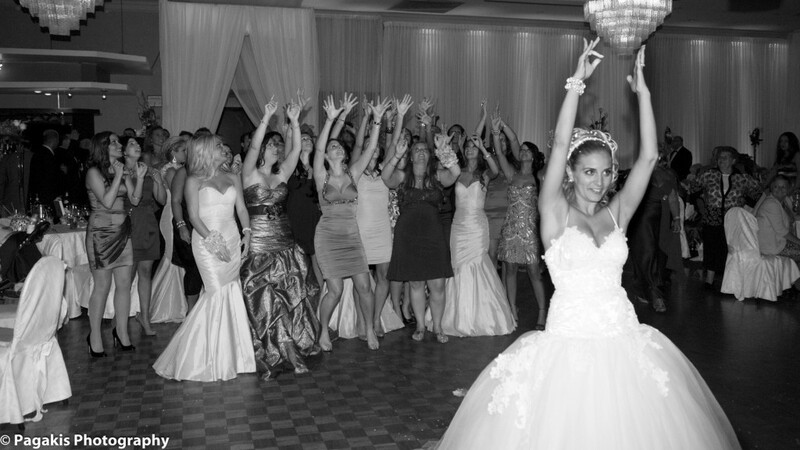 When a full meal is served, the dancing may begin immediately after the toasts so the guests can dance between the courses (if there is sufficient space). At a sit-down reception, the cake is cut just before dessert and slices are served with ice cream. When the reception is a buffet, the cake is cut later, shortly before the bride and groom leave. The bride cuts the first two slices, with the groom helping her by placing his hand over hers. He feeds her the first bite and she feeds him the second. When this ceremony is completed, a waiter cuts the rest of the cake for the guests. Another cake can be prepared and cut in advance to be packaged in pretty little boxes and offered to the guests as a lovely memento of the wedding. This is the best procedure for a buffet. Sometimes, the small top layer of the cake, called the "groom cake," is made of fruitcake that can be preserved by freezing. The idea is that on each anniversary, the couple will have a small piece of their original wedding cake to enjoy. When the cake is topped with an ornament, this too is naturally kept as a souvenir. View the many cake toppers in the online store. Just before leaving to change into her going-away clothes, the bride signals her bridesmaid, and they stand in a doorway, stairway or any spot where she can conveniently throw her bouquet. The bridesmaids help gather all the single women together to catch it, and the master of ceremonies stops the music to announce the event. According to belief, the woman who catches the bouquet will be the next to marry. After the bouquet toss, the groom takes the garter off the bride’s leg (often doing it with his teeth), usually on the dance floor. A chair is placed so the bride can either sit or place her foot on it to reveal her leg. The groom removes the garter and then throws it to the group of single men. The lucky bachelor who catches the garter will be the next to marry, just like the woman who catches the bouquet. 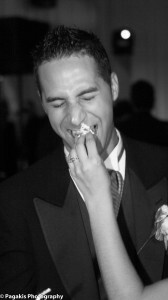 Many modern couples prefer to have the groom throw the bride's silk handkerchief in which some candies have been tied (to add weight). After dancing and chatting with all their friends, the wise couple will leave before becoming too exhausted. You can choose to disappear to change into your going-away clothes before coming back for a final getaway, or just make a grand exit after the bouquet and garter ceremony. A bridesmaid can be in charge of getting the parents of the couple to come for a last good-bye, and the best man leads the way through the crowd to the waiting car. The guests can be given flower petals, rice, confetti (if permitted), or blow bubbles to shower the couple with as they pass, calling out good-byes and best wishes. Find bubbles in the online store. Many couples will want to mingle with their guests and dance until the wee hours of the morning. 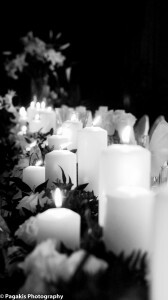 Tradition dictates that guests stay at the reception until the bride and groom have departed. If you plan to stay late, you should advise your guests, in which case proper etiquette indicates that they can leave after the cake cutting ceremony if they wish.